Simay-e-Azadi (The face of freedom) aka Iran National Television (INTV), is running a telethon, started from Friday, Nov. 30, 2018. 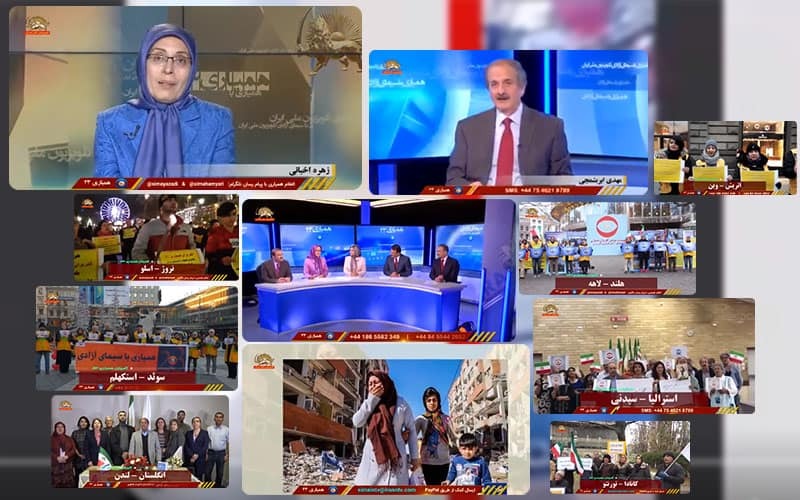 Here are some passionate calls by the from Iran, who contributed despite their economic constraints, also the phone calls from the exiled Iranian and expressing their support for Simay-e-Azadi, which show the popularity of this TV channel. It is to be mentioned that some Iranians inside the country deliver their contributions to Simay-e-Azadi through their relatives and friends abroad. This is mother Fatemeh, I am calling from Iran. I wished I could have attended your telethon with some bouquets of flowers but It did not go on as I desired. But since contribution to this event is the most priority of human responsibility, I moved from town center to a smaller house at the suburbs and I present what has remained to you, just as the bouquets flower. Contributions from some of the political prisoners besides their solidarity with the Simay-e-Azadi is an impressive aspect of this telethon. In this regards, Mrs.Sahar Sarkhosh, an Italy resident, said: “ A few months ago I could leave Iran. I was in the regime’s prisons and I suffered. Now I am out of Iran and I know very well that the only voice left to defend the people under suppression, is Simay-e-Azadi. In another emotional scene, some of the Iranian compatriots who had collected some funds for the INTV devoted it to the earthquake-stricken people in Kermanshahah. Here there are some Messages from compatriots who donated the collected funds to the earthquake victims In Kermanshah. During the live stream fundraising, there was a special guest. She was Ms. Zohreh Akhyani, the former Sec. Gen. of The People’s Mojahedin Organization of Iran (MEK|PMOI),the ran’s main opposition group,who stated: “Simay-e-Azadi has been a symbol in proving the motto “everything is possible”, while facing legal conspiracies lead by the regime, financial and technical barriers, but never gave up. of the Workers of Haft Tappeh sugar cane and Iran National Steel Industry Group (INSIG) in the city of Ahvaz, it is the voice of all truckers and all the people of Iran. Mrs. Akhyani continued: “I call on all freedom-loving compatriots to help this national media for its financial independence. Victory is at hand. A glance of Simay-e-Azadi’s popular call in last 24 hours, proves that the INTV is the only popular TV channel which has kept its independent relaying on Iranian financial support. The First Simay-e-Azadi Telethon took place 12 years ago, on May 28, 2006. Since then, this Telethon has turned into a symbol representing our countrymen and countrywomen in Iran and all around the world who has supported this national channel nonstop. Iran's Resistance TV (INTV-@simayazaditv) express the voice of freedom in #Iran. And they are trying to build a #FreeIran.